Historic buildings, like all structures, often develop problems with a foundation that is sinking or become unleveled over time. There is some special consideration to keep in mind in restoring historic building foundations. Older buildings are particularly prone to foundation failure for a number of reasons. Unstable soils – After a period of time, soils beneath and surrounding a foundation may become more compacted, shift, or develop gaps. This may be caused by flooding, removal or addition of trees and landscaping features, or years of changing soil moisture and freezing/thawing patterns. Improper water drainage – At times, historic buildings are built on old creek beds or new floodplains. Construction on adjacent properties or parking lots may have altered the flow of water toward the property. Over time, even weather patterns may require installation of improved interior and exterior water drainage systems to prevent foundation damage. Foundation materials – Many older foundations are built from bricks or stones with mortar that deteriorates over time or develops cracks allowing water to leak and damage the foundation. Dirt floors – Often older foundations have dirt floors that are more likely to allow water to enter the basement and cause further damage to the foundation. Because historic buildings may be somewhat fragile and have historical value, it is particularly important that you hire a foundation contractor with an established record working on historic buildings. Retain Original Function – The property must be used in its original function or be given a new use which reflects its original period. Retain Original Design and Features – Materials, features, spaces, and spatial relationships from the property’s period will be kept and preserved. Retain Original Appearance – Work to stabilize and conserve the property will be physically and visually compatible with the restoration period and documented for future research. Use Original Materials – Materials, features, and finishes characteristic from other historical periods will be documented prior to their alteration or removal. Use Original Craftsmanship – Distinctive materials, features, finishes, construction techniques, and craftsmanship of the restoration period will be preserved. Repair, Don’t Replace – Deteriorated features from the restoration period will be repaired rather than replaced. If a feature is replaced, it will match the old in design, color, texture, and, when possible, materials. Document Changes – Replacement of missing features will be documented to preserve the original history of the property. Prevent Damage to Materials – Chemical or physical treatments will be implemented in the gentlest means possible to prevent damage to historic materials. Protect Archeological Resources – Archeological resources affected by a project will be protected and preserved in place with as little change as possible. Protect Original Design – Designs that were never implemented during the restoration period will not be constructed. Below are some of the key steps you should undertake when hiring a contractor to repair or replace the foundation on your historic structure. Hire a Structural Engineer – It’s always a good idea to hire a structural engineer who specializes in historic building foundations or has some experience with historic structures to determine how much of your foundation needs to be replaced. A structural engineer will determine the underlying issues and best solution to repair the foundation and resolve the problem. Document the Details – Before doing foundation repair or any restoration on a historic building, it is important to document as many details as possible. Take pictures, do measurements, and write down details of everything you observe. This will ensure that the new foundation will look exactly like the old one. Hire an Experience Foundation Contractor – Especially with a historic property, it is essential to hire an experienced foundation contractor to restore the foundation. They will know and follow the restoration guidelines and will make certain that you have the necessary insurance and permit. Because of their experience, they will have knowledge of historic materials and techniques and take extra precautions so that none of the structure collapses or experiences further damage. Polyjacking.com has been a family owned and operated business since 1978 and has an outstanding reputation in restoring foundations of both residential and commercial structures, including historic ones. Choose Matching Materials – Often older structures will have a brick or stone foundation, so you want to salvage as many of the original bricks or stones as possible. Even if you replace the original foundation with a concrete one, you can do masonry on the outside to make the new foundation look like the original. Waterproof the New Basement – As long as you are replacing the foundation, you might want a contractor to place drainage tiles along the perimeter of the foundation to waterproof the basement. Polyjacking.com’s parent company, Pro Foundation Technology does basement waterproofing. Consider Related Projects – If you have an old staircase in the basement that cannot be used, hire someone to build a new one. It’s also a good time to check and replace any outdated electrical, plumbing, or drainage systems. Replacing the soil around the foundation with a quality black topsoil and grading it to a five-degree angle away from the foundation will provide good exterior drainage. Professional Experience – Polyjacking.com has professional experience lifting and leveling historic building foundations, including the historic Memorial Union at the University of Missouri and the 200-year-old Belle Meade Mansion in Nashville, TN. Ground Penetrating Radar – Polyjacking.com uses ground penetrating radar (GPR) to detect holes and voids beneath historic foundations. Hole and Void Repair – The polyjacking process fills in holes and voids beneath historic foundations, providing a strong and long-lasting solution without doing any excavation. Quality Products – Polyjacking.com uses only the finest tools and equipment from Earth Contact Products (ECP), the leading American manufacturer of foundation repair products. Quality Service – Polyjacking.com has an A+ rating with the BBB and has been awarded for super service by Angie’s List. The professionals at Polyjacking.com are experienced at lifting and leveling historic structures. We appreciate the extra considerations it takes with working on a historic site and we make the extra effort to preserve and protect the structure’s integrity. Whether you have a historic structure or are making history with a newer one, contact us today. With its beautiful Gothic architecture and bell tower, the Memorial Union at the University of Missouri has unfortunately been slowly deteriorating. This iconic building was built to honor the 117 Mizzou alumni who died in WWI. Due to soil erosion and severe dry conditions, voids and cavities formed beneath the surface. In turn, this caused the concrete slab to become uneven, becoming a significant threat to everything in its path. A team of engineers, with structural design and environmental engineering experience, inspected the damage. They came to the conclusion that polyurethane foam would be more effective as opposed to using mudjacking. NCFI’s TerraThane Geotech foam system, the best in the spray foam industry, was used to repair the settlement. The area consisted of 1,200 sq. ft under the offices of the buildings and 1,500 lbs of TerraThane was injected into the surface. Unlike mudjacking, which uses holes around 2-3″ in diameter, 5/8 inch holes were drilled into the surface without creating a mess. The process was quick, easy, effective, and didn’t require the building to be shut down during repairs. All of these factors played a major role in choosing polyurethane foam over traditional methods. Polyurethane foam fixed all soil issues without creating a burden on the soil. 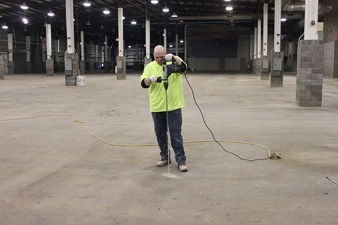 This makes polyurethane foam a permanent solution for concrete leveling. Read more about the Historic Memorial Union project. Did You Know Missouri is a Prominent Place for Sinkholes? Did you know sinkholes are a common feature in Missouri? 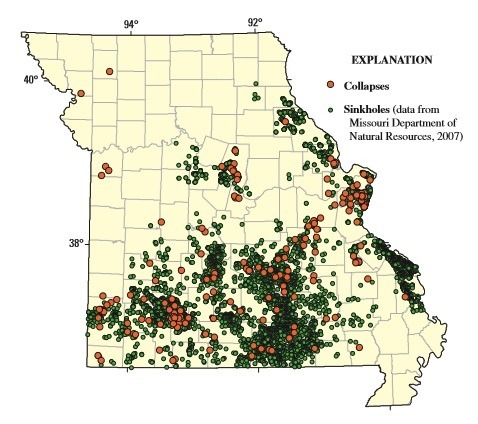 Most areas of Missouri are susceptible to sinkholes due to frequent exposure to water and the type of rocks underlying the soil. In fact, there are over 15,000 sinkholes in Missouri, and a lot more exist that are not reported or documented. If you are a homeowner or property owner, it’s important to be aware of the development of sinkholes and the warning signs associated with them. How do sinkholes develop? Sinkholes develop in karst terrains where the bedrock is dissolved by water. As it rains, water moves through cracks in the limestone and slowly dissolves the rock. Through this process, voids are formed and sinkholes develop on the surface. Over time, the voids become larger. As they continue to grow, they structurally impact homes and buildings, causing serious foundation problems. In addition, sinkholes can occur on streets, parking lots, and in yards. Many sinkholes are circular when they collapse, while others are not visible on the surface. Unfortunately, sinkholes can develop over time or suddenly. They can form in all sizes, they can be deep or shallow, and can even be large or small. The best way to identify sinkhole activity is to be aware of these common warning signs. If you notice a hole, secure the sinkhole by using warning tape or a rope to make sure people stay away from it. Next, fill the hole with sand, then monitor the hole and watch for changes in its size. Notify your insurance company, then contact a city inspection department or a professional engineer. How are voids detected? In addition to being used for foundation repair and slab lifting, a ground-penetrating radar (GPR) unit will be used to detect voids developed from sinkholes. A GPR has many advantages over X-ray methods. It uses a benign electromagnetic pulse and a high-frequency antenna to accurately locate voids. The GPR unit is portable to the site, making the process fast with instant results. For more information about sinkholes and voids in the Missouri area, contact our team of experts. Soil Shrinkage – When there are periods of hot and dry weather, soil shrinkage can form voids beneath foundations and concrete. Erosion – Excessive rainfall and melting snow can wash away the soil under your foundation and concrete creating voids. Hydrostatic Pressure – Heavy precipitation can also lead to an increase in hydrostatic pressure in the soil creating voids and causing the foundation to shift, settle, and sink. Heaving and Settling – Varying temperatures will cause the ground to freeze and thaw, which can cause voids to form. As a home or business owner, you may not even be aware these voids are occurring. This is why it is important to contact a professional with experience in void detection. Polyjacking.com can inspect your home or business using a Ground Penetrating Radar (GPR) for void detection in Missouri and Kansas. GPR uses a high-frequency radar antenna and advanced signal software to accurately locate voids and objects. GPR is fast, accurate, and inexpensive. This method of void detection detects embedded utilities, conduit, PVC, rebar, and tension cables. 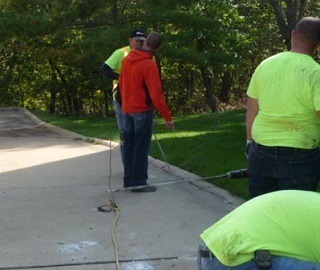 GPR prevents costly and potentially dangerous mistakes, such as cutting utilities or rebar. It is a much quicker and less disruptive method than other void detection methods such as X-rays. If voids are detected, we use high-density polyurethane foam to fill the voids. This polyurethane foam will expand to over 20 times its liquid volume to fill the entire void. The curing time is quick, so you can use the affected area about 15 minutes after the repair is completed. Poly trucks are used for the installation process. This method is relatively simple. A small 5/8″ hole is drilled through the affected area. Using our highly specialized system, polyurethane foam is injected into the void. As it expands, it fills the entire void. Lastly, the holes are filled, the site cleaned up, and the equipment is removed. Due to the short hardening time of the polyurethane material, the concrete surface is immediately ready for use. The dense polyurethane material is impervious to water preventing future erosion problems. Don’t let voids beneath your foundation or concrete cause you more expensive repairs. Contact the professionals at Polyjacking.com, a division of Pro Foundation Technology today! What products do we use to fix your concrete? For over three decades, Polyjacking.com has used polyurethane foam and the proper poly equipment to level basement floors, pool decks, and concrete slabs. Polyurethane foam has been tested to withstand the toughest conditions. It is economical and efficient because it is cheaper than removing and replacing existing concrete. It only takes a few hours for the project to be finished. There is no need for future repairs. The polyurethane foam creates a hydraulic lift that allows us to control the lifting process accurately within 10/1000th of an inch. The foam cures within 15 minutes of injection, so you won’t have to wait days for the foam to cure and you can get back to using the slab almost immediately. Before we level your concrete, we have to make sure there are no underground voids and objects. We use a Ground Penetrating Radar (GPR). GPR is a signal software with a high-frequency radar antenna to locate underground voids and objects. It is also used to locate utilities, tension cables, tendons, and PVC cables before we start construction. You don’t want to damage any systems that may be located under the slab. Polyurethane foam is also less disruptive and more durable than other methods, such as mudjacking. Because the curing time is so fast, lanes on a highway can be reopened immediately after the injection process. Nighttime would be the best time of the day to complete this process to minimize disruptions to people that need to use the area. Polyurethane foam is also strong and tough. It is even strong enough for roadway structures. The foam expands beneath the pavement filling every shape and size of all voids. Polyurethane is a moisture seal barrier, moisture resistant, and lightweight. In addition, it offers compaction ability. The base material gets stronger due to the material flowing into the sub-base and combining with soil particles. We choose to use TerraThane™ product line from NCFI because you won’t find a better product on the market today. Contact Polyjacking.com for fast, accurate, and honest service. We are your polyurethane concrete lifting team for places like Kansas City, St. Louis, Dallas, and more.